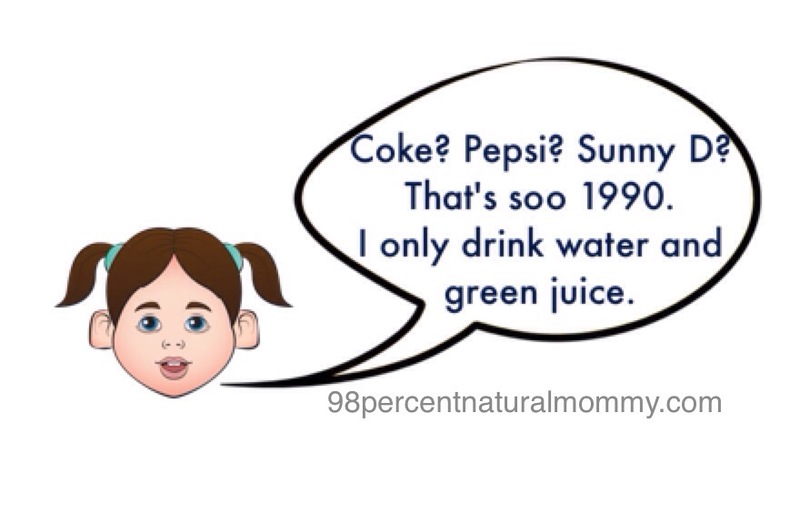 I drink green juice every morning and so does my toddler. 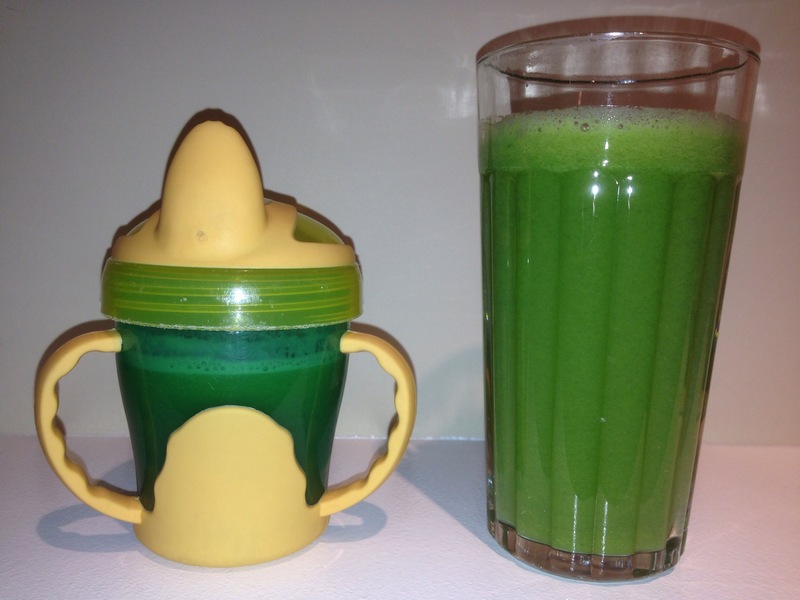 I do not drink green juice to replace the vegetables I eat, I treat it as a supplement to my daily diet. I would never eat as many vegetables as I juice in a day, much less all in one early morning serving, therefore I’m getting a lot of vitamins and minerals that I would not otherwise get in my diet. I would definitely not be able to get my toddler to eat vegetables for breakfast, but she happily drinks her green (or sometimes red) juice every morning before her usual meal. Some argue that without the pulp, I’m losing all the fibre so it’s not as beneficial as eating vegetables. I get plenty of fibre from the whole fruits and vegetables that I eat later in the day as well as from my afternoon smoothie. Aside from fibre, most of the nutrients are in the juice: and to reiterate, the nutrients that I get from my morning green juice are extra nutrients that I would not otherwise consume. As far as the concern about a blood sugar spike after drinking juice, that is more of a problem with sugary fruit juices. Vegetable juices do not have a high enough fructose content to have the same effect. Drinking vegetable juice has been proven to be an effective method of getting a variety of vegetables in your diet4. The plethora of benefits from eating (or drinking) more vegetables include reduced blood pressure4 and delayed onset of Alzheimer’s disease2. For children, a higher vegetable intake lowers their risk of obesity5. Vegetables are high in vitamin A, which is crucial for brain development in growing babies and children 3. I never used to eat a lot of vegetables (oddly enough for a vegetarian), until I became pregnant. I wanted my child to get all the benefits of a nutritious diet from the get go, so I forced myself to eat them. Over time I became accustomed to eating them regularly and actually began to enjoy the taste. When my daughter started eating solids I upped the ante even more and slowly cut out processed food. I wanted my daughter to eat healthy and stay away from junk food so I decided to lead by example. However, I was still concerned that neither my daughter or myself were getting enough vegetables, so when she was about 18 months old I started juicing a variety of vegetables. Children’s diets are strongly correlated with their parent’s diets, and mothers who eat healthy are more likely to have children who become healthy eaters 1. Infants and toddlers who are fed healthy food are more likely to become healthy eaters in adulthood as well as have better overall health later in life5. It doesn’t matter how you get your vegetables, as long as you and your children are getting enough. So whether you prefer to eat them, drink them, or both, just make sure your family is getting a good amount and variety of vegetables. 2. Lahiri, Debomoy K. Journal of Alzheimer’s Disease. 2006, Vol. 10 Issue 4, p359-361. 3p. 5. Venter, C.; Harris, G. Nutrition Bulletin. Dec2009, Vol. 34 Issue 4, p391-394. 4p. DOI: 10.1111/j.1467-3010.2009.01784.